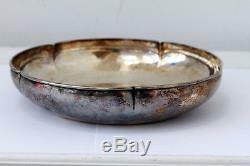 Sterling silver Arts and Crafts Bowl The Kalo Shops Chicago New York 8.5 diam. Offering for sale a Sterling silver Arts and Crafts Bowl by Kalo, Chicago. Markings on the base are Sterling, Hand Wrought, At Kalo Shops, Chicago and New York, 5 F. ---A hand hammered Arts and Crafts Sterling silver bowl in fine condition. The bowl weighs 13.6 oz. The diameter is 8.5 inches and it is 2 inches deep. We describe our items to the best of our ability and guarantee them 100% as described. We welcome international customers and appreciate your business. On higher cost items we will try to work with you in any way we can to minimize the cost. We spare no expense when boxing items with care so they get to you with no problems. We strive to help all our customers to the best of our abilities to build long lasting relationships. The item "Sterling silver Arts and Crafts Bowl The Kalo Shops Chicago New York 8.5 diam" is in sale since Friday, January 03, 2014. This item is in the category "Antiques\Silver\Sterling Silver (. The seller is "robertsilver" and is located in Orleans, Massachusetts. This item can be shipped worldwide.